Agriculture is a vital part to our lives. Not just to the farmers who are growing our food, but for the consumers who enjoy the fruits of our labor. All too often, consumers go to the grocery store and expect what they want to be on the shelves. If it isn't, they get upset and ask the grocery clerk to check the back. Well, how often does the consumer connect the dots from the grocery store to the farmer. Not enough. This week as we celebrate Agriculture, let's help consumers connect the dots. Today is California Agriculture Day and a great day to celebrate agriculture. This week, I had the privilege of volunteering at our local Farm Day in the City sponsored by our local Farm Bureau. Over 4,000 children from 3rd and 4th grade from all over the county come to the fairgrounds over two days to learn about agriculture, food and farming. It is an event that our local Farm Bureau has been organizing for over 30 years. 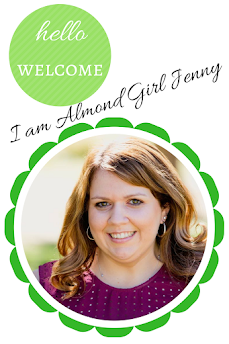 Similar events take place all over the state and nation and it is a great way to connect children to the food they eat. Kids get an opportunity to milk a cow, learn about irrigation, watch a cattle roping, ride on tractors and realize the importance agriculture plays in their everyday lives. All too often we drink that glass of milk and never think about the cow, dairyman or trucker that brought it to the store before you bought it. Not to mention the farmer who grew the grain and processor who made it into food for the cow to eat. There are so many steps involved to get our food to the store, in our fridge and on the table that we lose track of how it got there and the people involved in doing just that. Organizations like Ag in the Classroom are doing a great job at creating and distributing agriculture curriculum to those that need it. 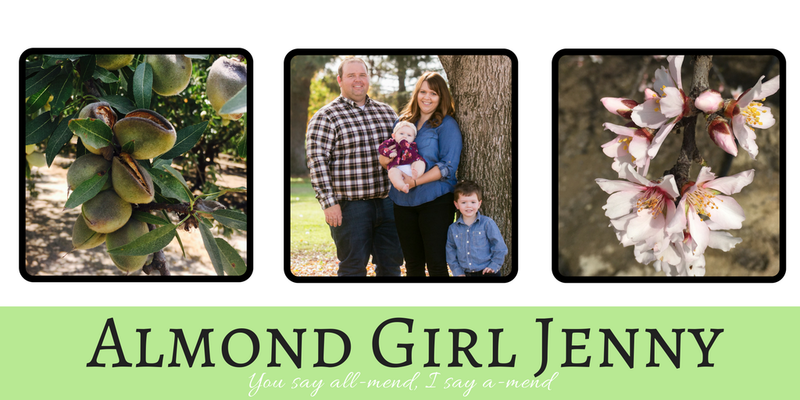 Through lesson plans, activity sheets, books, events, and grants they are able to reach a broader audience than your average farmer. Today, is also Ag at the Capital Day where agriculture organizations gather at the California capital steps in Sacramento to showcase agriculture and farming to not only our state legislature but children and public wanting to learn about food and where it comes from. These are great examples of ways farmers and agriculture organizations are trying to inform and educate children and the average consumer. Today and this week is really about education and the opportunity to showcase the abundance that California is able to produce with less and less. California is the leading agriculture state in the nation, growing far more than any other state. We grow more than 400 different crops, a majority of which are specialty crops that are unique and not grown in very many other places. 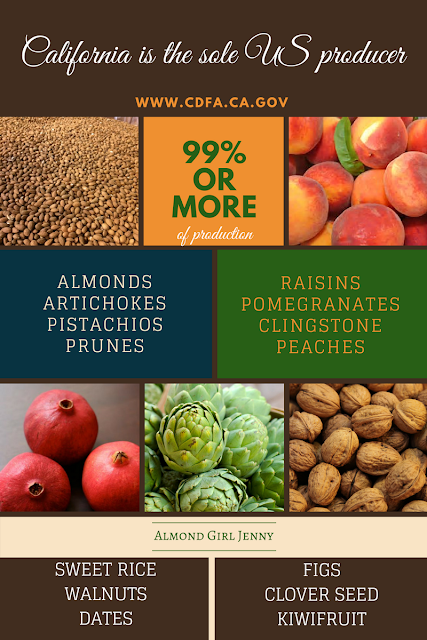 California is the sole US producer, producing 99% or more, of almonds, artichokes, pistachios, prunes, raisins, pomegranates, cling peaches, sweet rice, walnuts, dates, figs, clover seed and kiwis. 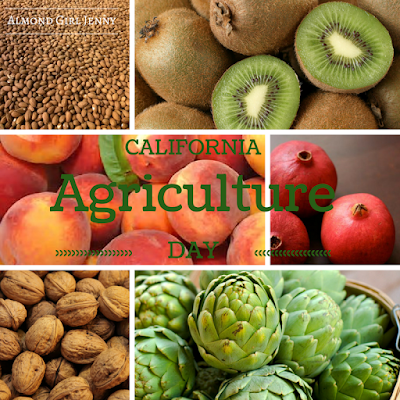 California also produces nearly half of fruits, nuts and vegetables grown in the United States. I'd say that is a state worth celebrating!